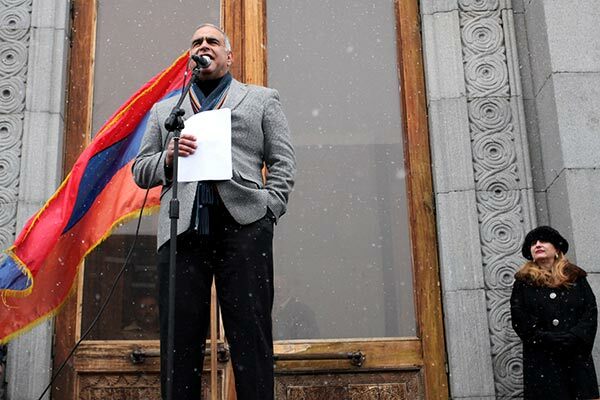 Raffi Hovannisian, who officially finished second in last month’s presidential election and is now disputing the victory of incumbent President Serzh Sargsyan, has vowed to continue his struggle for de jure presidency as he again rallied his supporters in Yerevan on Tuesday. Addressing several thousand people in the Armenian capital’s Liberty Square, Hovannisian slammed President Sargsyan and two other top officials for not accepting his invitation to attend the gathering or seeking to meet him otherwise to discuss ways of ending the current post-election crisis. “Now we have nothing to say [to them], we have to act and we won’t get diverted from our path,” stressed the opposition leader. Hovannisian also called on other political forces to participate in what he described as ‘a resolution of the all-national crisis’. He said he had already met with top representatives of the Prosperous Armenia Party, Dashnaktsutyun, the Sardarapat movement and was ready to meet with the leadership of the opposition Armenian National Congress if the latter were willing to have such a meeting. Hovannisian announced that he will spend the next two days again touring the regions and meeting with representatives of foreign diplomatic corps in-between before holding another rally in Yerevan on March 8. Answering skeptics who insist that he has no action plan, the opposition leader promised that they will see a “breakthrough” by next Sunday.